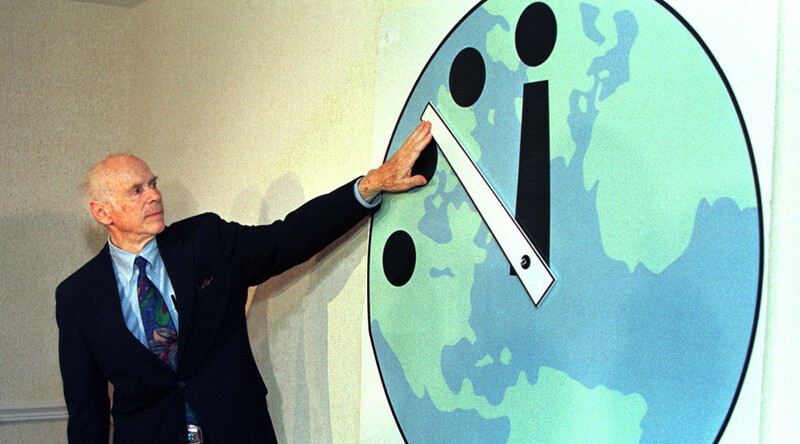 Scientists will reveal whether events over the past year have brought Earth closer to catastrophe when they reveal the Doomsday Clock’s time for 2017. The symbolic clock is intended to indicate how close the planet is to catastrophe. Decided upon by a team of scientists, including 15 Nobel Laureates, it was founded in 1945 by University of Chicago scientists involved in the creation of the first atomic weapons under the Manhattan Project. The clock sits at three minutes to midnight, the closest it’s been since the height of the Cold War when it reached two minutes to midnight. It was originally moved to three minutes in 2015 citing a lack of a global approach to tackle climate change as a major factor. The furthest the clock has been from midnight occurred in 1991 when the Soviet Union signed the first Strategic Arms Reduction Treaty, resulting in it being pushed back to 17 minutes to midnight.